Let it be known: I take no delight in posting such things, but sometimes the utter madness of it all surprises even me. I highlight here a February 21st Haaretz article by Israeli commentator and columnist Akiva Eldar that pulls together some recent occurences in the southern Hebron hills and elsewhere in the Israeli-occupied West Bank. (Following my comments, the full text of the article appears at the very end of this post.) Really, the things documented here are not unique or particularly earth-shaking — sadly, things like this go on almost every day. First, a guide to a few terms found in my comments, in the Haaretz article, and in other linked sources: MIGRON is a West Bank settlement “outpost” built on private Palestinian land, deemed illegal even according to Israeli law and long ago ordered demolished by Israel’s Supreme Court (it hasn’t been). The CIVIL ADMINISTRATION is, in essence, the army, specifically the Israeli military government that rules over the occupied West Bank. This entity, along with the army itself and other security services, exercise total control over AREA C, which constitutes over 60% of the West Bank. (The A-B-C protocol was set up in the 1990s under the Oslo Accords.) In Area C the Israeli government has frequently tried to declare tracts of land privately owned by Palestinians to be “STATE LANDS“, a legal concept rooted in the Turkish and British periods which the State of Israel has conveniently adopted. Journalist Amira Hass explains: “In the contemporary Hebrew idiom, on both sides of the Green Line ‘state land’ is a code term for ‘land belonging to Jews alone.’ In effect, it puts the burden of proof on Palestinian landowners, ususally through a protracted and ruinously expensive legal process, to try to keep their property from being confiscated. AREA B of the West Bank is supposed to be under the civil control of the Palestinian Authority and, by definition, free of settlement activity. RABBIS FOR HUMAN RIGHTS (which has a North American branch) and YESH DIN (“There is Law”) are both Israeli NGOs dedicated to pursuing human rights and offering legal assistance to Palestinian residents of the occupied territories. ITEM #1 This occurred in Ta’ale, an isolated rural community so tiny that it appears on no map of mine: Israeli occupation authorities showed up at the farmstead of the Awads, an Arab-Palestinian family, and gave them one minute’s warning before heavy equipment moved in and began demolishing their home and animal pens. When Mr. Awad protested and showed the Israeli official a perfectly valid interim order — issued by Israel’s High Court of Justice — delaying the demolition, not only was the order ignored but the effort earned Awad a slap in the face. After flattening the Awad’s dwelling, leaving this family of eight homeless in the winter cold and wet, and pulling down the animal pens on top of live animals (killing four and injuring many others), the government representatives intentionally fouled and then sealed with cement the family’s cistern — a hole dug to capture rainwater off the surface of the ground! Here is the Ta’ale demolition story as reported by Rabbis for Human Rights; it includes several photographs and pieces of VIDEO documenting this despicable act of destruction. (For regular readers of this web-log, this story may remind you of something…) Incidentally, according to UN data these sorts of demolitions increased in 2011 by almost 400% compared to the previous year — no, it’s not a ‘typo’: a four hundred percent increase in one year. Now, were the Awad’s structures (and hole in the earth!) built without the permits required by the Israeli occupation authorities? Almost certainly. Do the Israelis ever grant Palestinians permits to build anything in Area C, even on their own property? Almost never. Thought questions: Does it occur to you why the State of Israel has such an intense interest in the Awads’ meager holdings in the first place? Would it surprise you if the goal were actually to drive these people off their land in order to declare the piece of property “state lands”, to the benefit of some neighboring Jewish settlement? It wouldn’t surprise me, not at all. What do you think it’s all about? ITEM #2 The second incident Eldar mentions is the threatened destruction of several renewable energy installations that have been built on private Palestinian land, with the help of European and Israeli civilian interests, and are now providing power to scores of families who have never before known what it was to have even a simple light bulb illuminating their home. The Israeli occupation authorities have recently issued a stop-work order on these systems, some of which are already up and running, which is usually a prelude to a demolition order. The story Eldar refers to was reported on 16 FEB by Common Dreams on their web-site; they in turn quote other sources, including Der Spiegel. 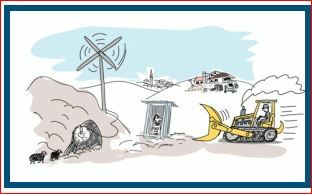 As the Amos Biderman cartoon illustrates, some of the people benefiting from the new sources of electricity, now threatened with destruction, are literally living in caves, a traditional type of habitation still seen in places in the southern Hebron Hills. Needless to say, they are ‘dirt poor’. Here is much more on the renewable enery project itself, including a short VIDEO, from the group of activists who are building and installing the systems, COMET-ME; they suggest several actions whereby caring people can help counter the threatened destruction. The Civil Administration says “The plan that the residents submitted [to erect something on their own personal property!] was rejected by the planning committee in June 2011 and for this reason it was decided to enforce it. 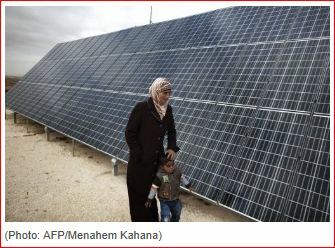 The solar installations are illegal and therefore a court order was issued against it…” And that’s the way it goes in Area C, which is over 60 percent of the West Bank: every shack and animal shed, every well and every cistern, all on your own land: “illegal”. Why even bother seeking a permit or submitting a plan? In this case the people did, and it was rejected. Bottom line: People have to live, and to deny them the means to create a simple, decent existence is simply inhumane. What do you call it? Item #3. Finally, the Akiva Eldar piece touches upon something that is more an ongoing and widespread phenomenon: the relentless encroachment of Israeli settlement outposts onto lands not only privately owned by Palestinians but also lying within Area B which, again, is defined as being under the civil control of the Palestinian Authority. The story was reported by Haaretz on 19 FEB, based on investigative work done by Dror Etkes, who has monitored the settlements for years. I will not comment, except to say that the Israeli occupation authorities find it quite convenient to simply look the other way as these flagrant violations are taking place, essentially the stealing of many, many acres of somebody else’s land. UPDATE on this issue, 11 MAR 2012: Today’s Haaretz reports on a legal-bureaucratic impasse, between the “army” army and the Civil Administration, which is preventing any effective response to this situation; long story short: nobody wants to deal with reigning in the settlers’ voracious appetite for Palestinian land. Since we’re on a roll, here’s one more recent article that illustrates how the present Israeli government is simply capitulating to the interests of the (100% illegal) settlement enterprise. This comes as no surprise, really, since the Israeli governments over the past 40-plus years created the settlements, step-by-step, and have facilitated their growth in every possible way. Here’s the new bit, though: The Army’s Civil Administration has recently proposed a change in the law which would allow the settlers to cut new dirt roads, with no special permission or oversight required, outside the designated boundaries of their settlements, as long as they are designed to “protect state lands” (a highly questionable concept to start with). Think about it: Despite the presence of multiple Israeli security forces in the occupied West Bank — the IDF, the Border Police, the regular (“blue”) police, and private, hired security guards — now (if the change is enacted) the most extreme and ideological of the settlers (who else would?) will be patrolling in their vehicles, in areas outside their fenced settlements, on roads they themselves have built without any oversight, in order to “protect state lands” (read: bar any Palestinian access to those areas). Commentary: It’s a land grab. It’s the Wild West. Two weeks ago I reported here on the state’s campaign against Palestinian residents in the southern Hebron Hills … Two days later, the residents of the nearby village of Jinba summoned their lawyer, Shlomo Lecker. They said Civil Administration officials had presented them with demolition orders for the awnings that provide shade for residents and their sheep, and a few toilets built with donations from the Anglican Church. The Civil Administration officials did not even grant the Jinba residents seven days to appeal, as the state prosecutor’s office had agreed to in a letter to Lecker five years previously. They settled for three days, including Friday and Saturday. Civil Administration officials say the structures were built without permits. That is true. Since the area is designated a “firing zone,” it is impossible to obtain a building permit there, even for a dovecote. …and on and on… Now, a Bethlehem car-wash! Israel’s eagerness to demolish renewable energy installations in a West Bank village is seen as an ugly riposte to the European Union. It happened last Wednesday. Civil Administration officer Nabil Tafsh arrived at Youssef Awad’s hut accompanied by a bulldozer. Awad told Rabbis for Human Rights representatives summoned to the site that the official informed him he had one minute to leave the hut and remove the sheep from their pen. Two soldiers forcibly removed Awad and, in a flash, the bulldozer flattened his minimal possessions into a pile of rubble. Eight people, including children, were thrown out of their shabby hut and left without a roof over their heads on a rainy winter night. The sheep pen was destroyed, and buried underneath it were 15 lambs and a dovecote. Four lambs died, four were injured and 400 head of sheep that were spared lost their shelter. The water cisterns used to provide for the flock were destroyed and sealed. In a complaint submitted to the Civil Administration, Rabbi for Human Rights attorney Quamar Mishirqi wrote that Awad presented the officer with an interim order from the High Court of Justice ordering a delay in the implementation of the demolition order issued against him. She says the officer tore up the document and slapped Awad across the face. Mishirqi presented an agreement with the State Prosecutor’s Office granting Awad 60 days to approach the High Court of Justice before his property would be destroyed. According to her, were it not for a hasty phone call she made that day to the Prosecutor’s office, it is almost certain that the Civil Administration would have proceeded to demolish all of the village’s houses. The next target of the Civil Administration (which, of course, carries out the government’s policies) in Tha’lah and nearby villages are renewable energy installations – wind turbines and solar panels that two good Israelis, Noam Dotan and Elad Orian, members of Comet (Community, Energy and Technology in the Middle East ), set up for them. Around 1,500 people in 16 communities, that have been in the area since the 19th century, now benefit from energy produced by these installations, which provide lighting and electricity to their modest dairy product business. 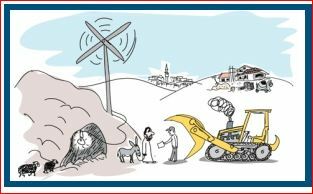 A few weeks ago, the Israeli administration – the one that arranges to run high-tension lines over their heads to supply illegal outposts – decided to issue work stoppage orders to five installations. The demolition orders expected to follow will darken the homes of 500 people. Children will revert to straining their eyes as they do their homework in the light of oil lamps, and the women will go back to churning butter and cheeses with blistered hands. The new facilities were built mainly with money from the German taxpayer. The German government contributed 400,000 euros to the project, in addition to more modest sums from other organizations. During a visit to Israel three weeks ago, German Foreign Minister Guido Westerwelle asked the prime minister, defense minister and foreign minister to work to cancel the orders. Everyone promised to look into the matter. The response arrived a week later in the form of a new work stoppage order for another installation. A German Foreign Ministry spokesperson said the German government is aware of the stoppage order for the solar energy systems in Tha’lah, and is in close contact with the Israeli government in order to find an amicable solution. The German press sees Israel’s behavior as a rude gesture to the European Union, which dared publish a report critical of Israel’s discriminatory policy toward 150,000 Palestinians in Area C, who have survived the harassment of the authorities and the fury of the settlers. During the first six months of 2011, the UN Coordinator of Humanitarian Affairs recorded 342 demolitions of Palestinian structures in the area. That is almost five times the number razed during the same period in 2010. The report noted that for Palestinian villages in Area C, the Civil Administration did not manage to plan sufficiently, but all Jewish communities in the West Bank did receive detailed plans. Civil Administration officials are busy with Palestinians’ wind turbines and goat pens. No wonder, then, they have no time to deal with a few structures that settlers are building on stolen lands. Not just stolen from Palestinian landowners, but also from the Palestinian Authority. Two days ago, Haaretz published a list of outposts that are moving into agricultural plots in Area B, which is under Palestinian Authority civil control. A petition submitted to the High Court of Justice on Monday by a resident of the northern West Bank village of Amatin, with the assistance of Yesh Din, shows that the name of the Havat Gilad outpost was omitted from the list. The petition claimed that people from the outpost built two houses on Palestinian land, contrary to the law and the Oslo Accords. The inspectors are in no rush to go back there. The last time, they got out by the skin of their teeth. Regarding this matter as well, there was no comment from the Civil Administration. Israel’s High Court ruled on Monday that the state must respond within seven days. * See this RELATED POST dealing with the on-going destruction of Palestinian cisterns — holes in the ground (!) for collecting rainwater. The Israeli strangle-hold on rural Palestinian families in the occupied West Bank is seen in microcosm, documented in this brief (3 min.) VIDEO. The family profiled is banned from making even the simplest changes or improvements to their private land–and their goats are forced to drink water fouled by raw sewage from the nearby settlements, water which has long since killed off any productive agriculture. The area in question, the Wadi Qana valley, lies in the northern West Bank amid a cluster of illegal Israeli settlements, northwest of the huge settlement of Ariel. Part of the valley has been designated by Israel (illegally) as the so-called “Nakhal Kana” nature reserve. Wadi Qana valley (just left of and above center), amid a gerrymandered mess of walls, checkpoints and other barriers and engulfed in a sea of purple (settlement built-up areas [dark] and settlement-controlled lands [light]), The surrounding blue areas are “Area C”, under full Israeli control since the 1990s. SOURCE: UN-OSHA Humanitarian Atlas (2011 version). This entry was posted in Israel-Palestine Scene, Occupied Territories, Palestinians, Politics, Separation Barrier, The Occupation, West Bank and tagged Akiva Eldar, Area C, Civil Administration, demolitions, Nakhal Kana, Occupied Territories, Settlers & settlements, The Occupation, Wadi Qana, West Bank. Bookmark the permalink. Oh, yes: In some of the video of the Ta’ale/Tha’lah demolition there appears, very near the camera position, an Ethiopian border policeman (who actually seems quite clueless). Here’s what occurred to me: This man, or perhaps his parents, who I will presume possess at least some tenuous link to Judaism, were brought from Africa by the Jewish Agency to live in Israel, where they have been granted citizenship along with all the benefits it entails. Now, here he is (clueless), in an area taken by Israel by force of arms 44 years ago and held under military occupation ever since, helping supervise the dispossession of a dirt poor Palestinian family, people who are stateless and enjoy virtually no civil rights, who dared to try to make a life for themselves and eke out a living from the land. I don’t mean to pick on the Ethiopian man — he was “only following orders” — but how bizarre and profoundly unjust it all is… Comments? The real security threat to Israel is the mutual work of Israelis and Palestinian. working shoulder to shoulder for the benefit of the people in respect and trust. Trying hard to plant some sane seeds of peace in the harsh area. This is the real danger to the state of Israel. I suspect this is Noam Dotan, who is spearheading the building and installation of the energy systems through the activist organization COMET-ME (see: http://www.comet-me.org). Just so you don’t miss what he’s saying, in your mind put “threat” and “danger” in quotes: Yes, cooperation, respect, trust and peace-planting — all threaten the status quo of this oppressive regime of occupation, and thus will be perceived as “dangerous”. It’s very sad that this is how Israel chooses to respond to a project that is all about hope, sustainability and cooperation. But the demolitions are still stoppable. Israel has not made its final call yet. Just as Israel issued the demolition orders, it can take them away. You can see Comet’s effort to stop the demolitions on their website: http://www.comet-me.org. Aya, thanks for pointing all of us to the COMET-ME site, the good people behind the energy systems. I have added this information into the post.